Static and spinning options in one. Double width support dome for maximum stability. Revolutionary new joints-easy to use,quick to install. Micro articulating base-easy to set up on uneven floors. Smooth pole from top to bottom-no transition between tubes. The package list on the user manual has a little difference from the received item. the flange nut has been attached to height adjuster and both of these have been installed to the mian pole. Kindly remind: please check the CD installation video before you put the pole together, then you can install it smoothly. If there is any question, please feel free to contact us for help.Thank you!! Height adjustable from 7'4" to 9' easily via height adjuster with cover. 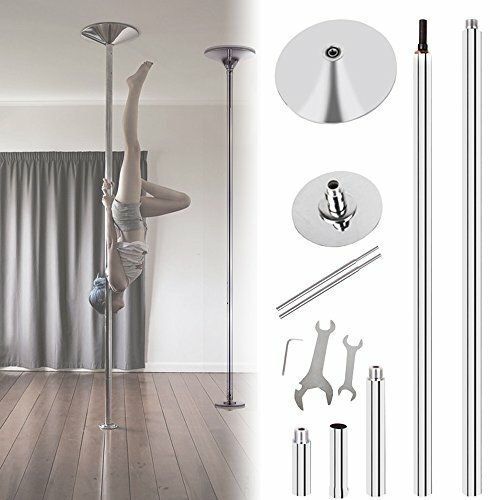 Dual function pole - Static or spinning options can be choosen (2 hidden lock screws). Installation DVD is included, which helps you install the pole easily. If you have any questions about this product by Ridgeyard, contact us by completing and submitting the form below. If you are looking for a specif part number, please include it with your message.